Boulder Canyon's bold and bright flavor color coding works very well with this purple. 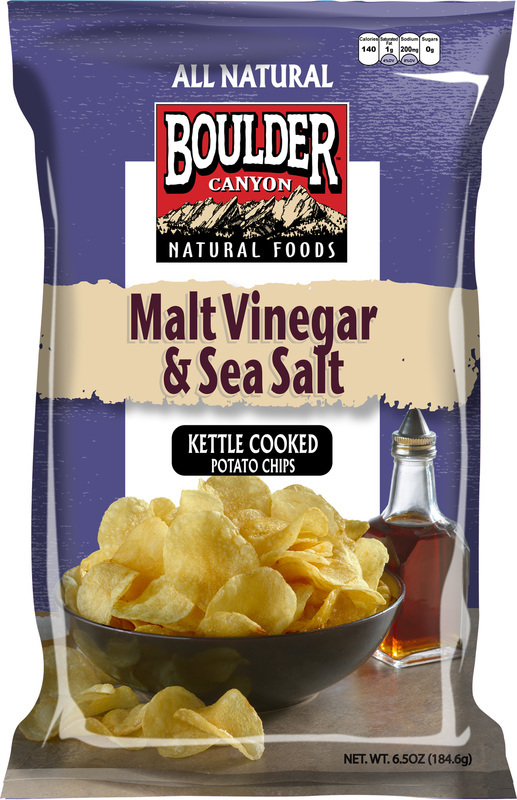 Malt Vinegar & Sea Salt may be a fancy 21st century description of the otherwise standard Salt & Vinegar Chips, but in combination with the color, and even the bottle of Vinegar, makes it appear a more luxurious version. Of course, it won't be, but a premium aura provides a premium experience in the mind of the consumer. the Snap Test saw a large Chip broken in half with a good crack, but there were a few smaller Chips that were a little sodden and a bit less sturdy. On the whole a reasonable bag of thick, Kettle Cooked Chips. There was a little powdery residue that stuck to the fingers with the oil, but not a great deal. There were also some wriggly and curly bag constituents, but most Chips were whole, large and unbroken. For some, you can't beat the smell of a freshly opened bag of Salt & Vinegar. These were among the best. The rich potato smell was added to by the taste which saw a good balance between potato, salt and vinegar. Some like Vinegar Chips to be sharp and harsh, but the British invention of this flavor combo provides a rather more balanced flavoring. With no dominant taste, these worked as well as any.